A popular topic I receive requests for audio training and advice on relates to broadcast mixing. I enjoy mixing for broadcast because it combines my love of mixing live events with my love of mixing in a studio-esque environment. 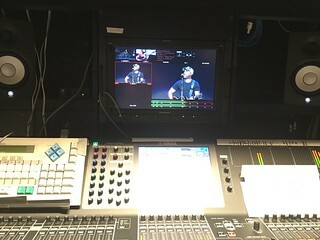 While in one sense, mixing is mixing, there are some unique differences on the broadcast side compared to mixing FOH. Mixing live sound has its own challenges, however, it also allows me to fudge some things at times. Since room acoustics may play a big part in a live experience, the reverberant space that sometimes hinders us may also help us by covering up and smearing details. For myself, this kind of thing can be frustrating most of the time, but I’d be lying if I said I never used it to my advantage to put a mix together. Broadcast is a different animal, though, because those details may or may not be audible to a listener. It all depends on how they’re listening to the broadcast. With our live sound mix we can primarily focus on simply mixing for the room, however, with broadcast we need a mix that translates to a wide variety of listening environments and technology. So how about a cheat that may help with that translation? Many, if not most people these days are listening to “broadcast” audio on laptop speakers, TV speakers, and even cell phone speakers. 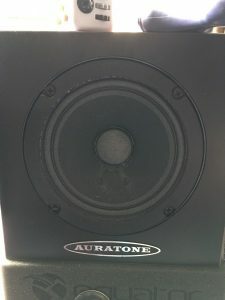 A common element with all of these speakers is they tend to be pretty small which limits their resolution especially when it comes to frequency response. One of the tricks, or cheats, to making sure your mix will work on those other systems is to monitor in a similar fashion while mixing. The challenge, though, is you can’t listen to only that type of speaker because there will be listeners using better playback systems as well. Personally, my goal when mixing in any studio environment whether it’s broadcast or in my personal studio is to have a mix that works on a great system but also translates to the more general listening systems such as laptop speakers. This means I still want to use a quality monitoring system when I’m mixing. This also brings up a common misconception about studio monitors. 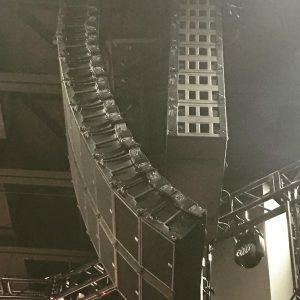 In the live world, we typically want a killer loudspeaker setup as the quality of the system directly influences our audience’s experience. In the studio, monitoring is often more about being able to hear what’s necessary to craft a great mix, though. So in the studio it’s not as much about having something that sounds “great” as it is about having something that is “accurate”. Many studio engineers actually employ multiple sets of monitors when mixing in the studio. This way they can have an accurate set of monitors along with something that represents more common listening setups. 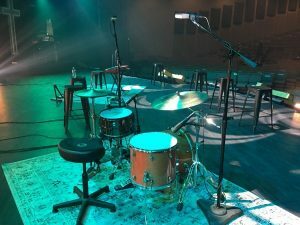 The challenge I find many churches have, though, is they only have one set of monitors, and their budget or setup doesn’t really allow for multiple sets. But that’s OK because I have a cheat for this. Instead of using multiple sets of monitors, you can cheat this idea by simply using an EQ on your monitors. Depending on your setup you might be able to permanently have an EQ in place, but if you can’t you can just use an EQ on your master buss during rehearsals or virtual mixing. Just remember, if you use an EQ on your master you have to make sure it is off whenever you are live on the air. In fact, I can’t stress that enough. You will not want this EQ on anything that goes outside of your mixing environment so use this at your own peril. So what do you do with the EQ? There are a few different settings you can play with, but I recommend you simply take a high-pass filter and crank it up to about 200-250 Hz to start. That sounds kind of high, though. It is kind of high, and that’s the point. You want to remove those nice low frequencies from your monitoring so you can focus in on the mid-range. Low frequencies easily trick us especially if we are used to working on big PA’s. With the low-frequencies removed, you can get a better idea of what’s actually happening with your mix. Plus, that setting really isn’t that far off from what a lot of people are listening to these days. When I use this trick, I build my mix like normal and when it’s feeling good I flip that EQ on. Then I ask myself if I can still hear everything. Do I lose the bass and/or kick now? Did my mix balance change? Is anything suddenly jumping out at me? I’ll make some adjustments and then turn the EQ off to see how everything fits. I may want to make some additional adjustments with that EQ off because I will weigh the full-range listening experience above the limited/laptop range. I’ll probably repeat the process a few times while refining the mix, too. One thing to keep in mind, though, is I’m not going for perfect translation to a laptop. I just want the mix to hold up there and not change in a drastic way. By the way, if you think this is only for the studio, you’d be wrong. Give this a try next time you’re working in virtual soundcheck at FOH. 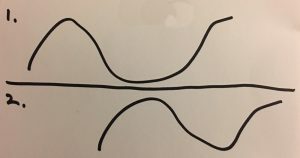 If you ever struggle to get definition out of your bass guitar, this might help you figure out how to make it cut in the mid-range. Great article! I frequently turn off my subs during rehearsals and virtual sound checks to focus in on the mix. I find it helps me zero in on problem areas between kick and bass especially.